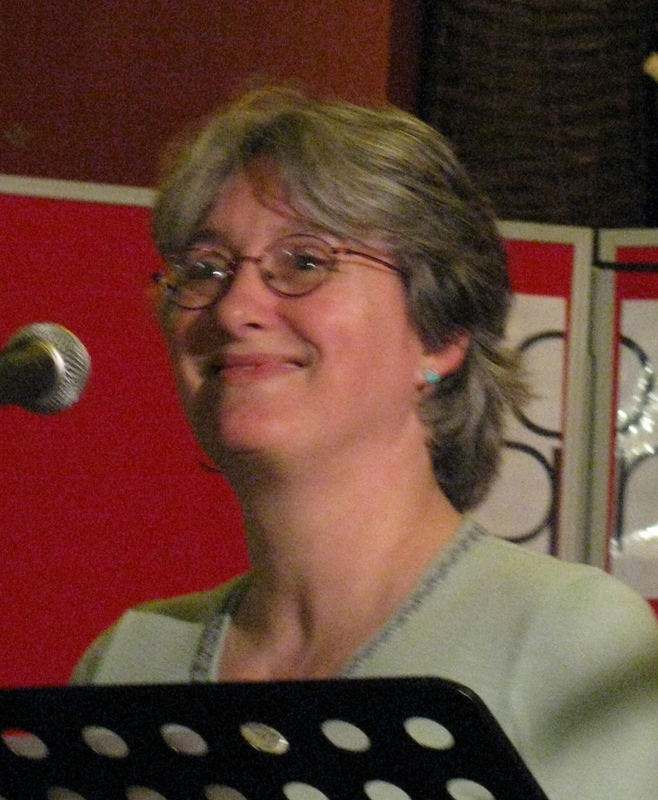 Anne Stewart is a poet and reviewer, and provider of service to poets and poetry organisations. She has judged several poetry competitions, run day-workshops on “Form and Creativity” and, as part of Poetry on the Lake festivals organised by Gabriel Griffin in Orta San Giulio, short writing workshops with Italian students. She has also led delegations on working visits to Munich and Bucharest (Ludwig Maximilians University and University of Bucharest). Her poetry has won or been placed in several poetry competitions, including winning the Bridport Prize, the Silver Wyvern (Poetry on the Lake, Italy) and the Southport Poetry Prize, and a long-listing (top 130) in the National Poetry Competition. In 2014, she was awarded a Hawthornden Fellowship. Her work has been widely published in poetry magazines and anthologies (to date, in at least one anthology every year since 2005). Her first collection, The Janus Hour was published by Oversteps Books in 2010 and her second full UK collection, The Last Parent by Second Light Publications (2019). Order Form or buy online from poetry p f. See Second Light Books for Book Club offer (6 copies for £40 + feedback). Meantime, 2 small bilingual collections were published in Bucharest: Only Here till Friday (Bibliotheca Universalis), 25 poems, in English/Romanian in 2015 and in English/Spanish in 2016; in 2017, Let It Come to Us All, 17 poems, in English/Romanian, translations by Prof. Dr. Lidia Viana of the University of Bucharest, was published in print by Integral and in an illustrated online version by Contemporary Literature Press. Dates and details of other events to follow. 2018 events included readings for Oversteps Books and Grey Hen Press, and two poetry pRO readings (The Jolly Sailor in Canterbury and the Torriano Meeting House in North London). Other readings and talks took place at the Poetry on the Lake festival (Orta san Giulio, Italy), the Kent Association for the Blind, Poetry South East (at the Bakewell Theatre in South London) and Poetry in Palmers Green. A 3rd delegation visit to Bucharest took place in April, working with students of the University of Bucharest and beyond on their translations of short stories by Romanian authors. The other 4 participants this year were: Caroline Carver, Kavita Jindal, Peter Phillips and Dorothy Yamamoto. All of these poets are listed at the poetry p f website. Several of Anne’s poems are included in Five British Poets (in print, Editura Muzeul Literaturii Române) and Romania’s Moment (online, Contemporary Literature Press), and in Quartet the four seasons (ed. Deborah Gaye, Avalanche Books). Other poems appeared in Orizont (Bucharest), Acumen, ARTEMISpoetry, South, and a privately published anthology, A Poem to Inspire (by Paul Whymant in aid of Macmillan Cancer Care). When I come back is included in Hedgehog Poetry Press’s project, Ribbons of Poetry, in hand-written manuscript and online, in 100 Vapour Trails (067). An introductory review of Carole Satyamurti’s major work The Mahabharata – a modern retelling is included in ARTEMISpoetry, Issue 20. Anne tutored a further day-workshop on “Form and Creativity” in August. Kent North West Stanza monthly (mostly!) evening meetings: Poetry & discussion, workshopping and so on. 8pm in The Two Doves, 37 Oakley Road, Bromley Common. Dates and more information here. Shortlands Poetry Circle twice-monthly (mostly!) afternoon meetings: Poetry appreciation group at the Ripley Arts Centre in Bromley. Anne’s three year Presidential term is at an end. This reading group comes highly recommended to anyone who enjoys poetry, whether that includes writing it or not… Events here, More about the Circle here. May & November Second Light Spring and Autumn Festivals at The Art Workers Guild near Russell Square, London. July/August: Second Light’s residential week at Holland House in Worcestershire. Photo by Philippa Lawrence, taken when she and Anne were working on Philippa’s pamphlet collection, From Memory’s Wardrobe. Speaking nicely to misbehaving machines works more often than you might think! Or is it the ‘laying on of hands’? 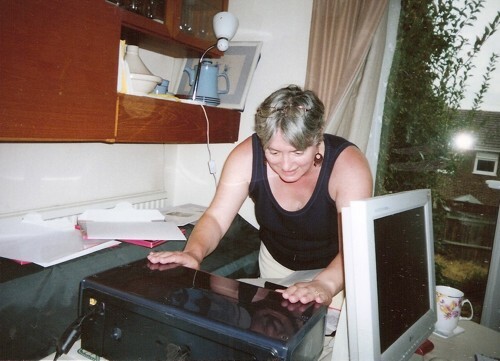 Anne Stewart, 20 Clovelly Way, Orpington, Kent, BR6 0WD. UK.